You’ve just spent thousands on your new motorcycle and polished it to show room condition. So why might you want to cover it up and hide it? The reasons vary, but protecting it from the elements and keeping the thieves guessing are high on the agenda. Of course it’s pretty obvious that beneath the silver cover lies a motorcycle and not a washing machine or the elephant man but who’s to know whether it’s a gleaming new Beamer or a beat up old pizza delivery scooter? Choosing a cover that’s right for you depends on where you might need it. For indoor or garage storage you won’t need a water proof cover. Neither will you have to worry about damage from the wind. Perhaps a simple dust protection model will do. Outside a motorcycle is subject to the full might and variances of British weather. It pays to consider the risks before buying your new cover. The Moto GP provides a lot of cover for your money. The higher specification Oxford Protex Stretch gives the biggest coverage allowing for panniers and a top box and probably a tank bag too should you wish to leave it attached. Why buy a cover and what should you look for? A stranger walking up to a motorcycle and peering underneath the cover is likely to attract attention. Anything that slows down a thief improves the chances of your bike remaining where it is. Shiny new, valuable bikes stand out. Cover them up. A brief rain shower is unlikely to ruin your bike. But parked outside and exposed to the elements for weeks on end will result in a slow deterioration. A cover will dramatically reduce this exposure and prolong the life of your bodywork and parts. High winds, sand, mud, twigs and insects may blow on your machine not to mention snow and ice in wintry conditions. A cover will keep the worst of it from seeping into the gaps. Maybe you just want to keep people guessing like nosy neighbours, colleagues or your accountant. A motorcycle cover is the perfect item to conceal that what lies beneath is not a gleaming Harley Davidson but a post war BSA rescued from the scrap heap. You can also use it as a decoy tricking would-be thieves with a pile of boxes while the real thing is hidden safely away in your garage. Your spouse’s beloved moggy may not steal your bike but they’ll scratch and puncture its seat covering given half a chance. Parking under a tree might shield your bike from the sun or rain but the acidic calling cards of our feathered friends wreak havoc with its bodywork. 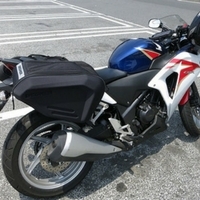 Both can be avoided by draping your machine with a good motorcycle cover. Standing next to your bike for ten minutes waiting for it to cool down isn’t convenient if you’re hurrying to work or late for an appointment. Neither do you want to melt your new motorcycle cover against hot exhaust pipes. Choose a cover that has built-in protection against the heat. Often this comes in the form of heat-resisting panels and lining. Despite interior heat-resistant lining it’s a good idea to avoid a cover’s direct contact with a hot exhaust pipe by ensuring an even and roomy fit. A decent cover can also be stolen but holes for locking chains may keep it secure when parked. Don’t underestimate the wind. Once a strong breeze gets underneath the cover it can lift it like a hot air balloon and tear it apart over a few hours. Choose a model that has not just a middle strap but clips on the front and rear too. In extreme conditions you may wish to consider an additional restraining strap just to keep things really tight. 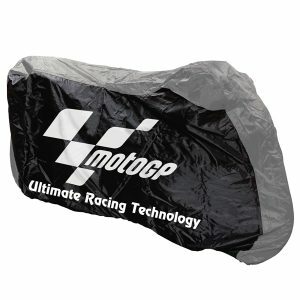 A bike cover is also good for long-term storage for those who wish to hibernate their machines during winter. They also protect against any chemicals or corrosive liquids that might drop from garage shelving or roofing while sitting for months on end. At 2kg the JDC cover is a heavy-duty all-weather model with many features. Made from thick breathable material it has a soft lining and silver heat resistant panels to protect it from exhaust pipe burning. An all-round elasticated rim is supported by an adjustable buckle strap in the middle ensuring that even in the strongest of winds the cover stays in place. The soft black cotton lining protects your paintwork and windshield from scratching. Covered handlebar vents allow the escape of trapped moisture and outlets at the front and back allow a chain lock to pass through. Double stitched for strength and durability. Comes with a zipped storage bag. Good overall coverage almost to the ground. More expensive than other models but still good value. 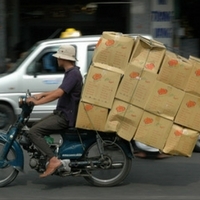 Weighs slightly more and consumes more extra space than lighter models. 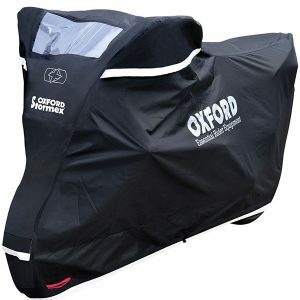 This is a stylish waterproof and heat resistant motorcycle cover from leading UK manufacturer, Oxford. With top to bottom protection the cover stows neatly away when not in use. It’s double stitched nylon provides extra strength and durability. You can choose from many sizes and also options that will cover a rear top box. A middle-located strap keeps the cover secure in windy conditions. 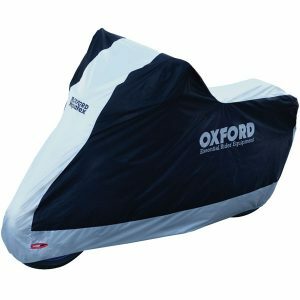 Oxford’s more heavy-duty model is the Stormex Bike Cover weighing in at around 2.5kg. 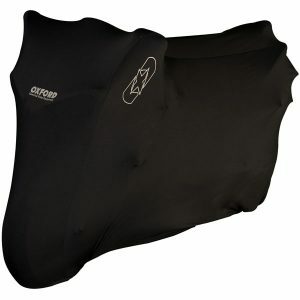 Its tough outer cover protects against knocks and weather extremes. Its tough outer cover protects against knocks and weather extremes. The soft heat-resistant lining protects against scratching and heat damage from the engine or exhaust. Reflective panels increase visibility at night, although not everyone might want their bike to be seen or their number plate on view. Strategically positioned holes facilitate the use of a lock and a pouch helps to keep your padlock off the ground. 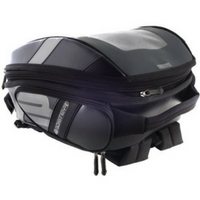 The Protex Stretch covers not only your bike but top boxes and panniers too. The double-stitched nylon adds strength and durability along with its three layer all weather protection. The elasticated bottom has an adjustable belly strap to keep it in place. 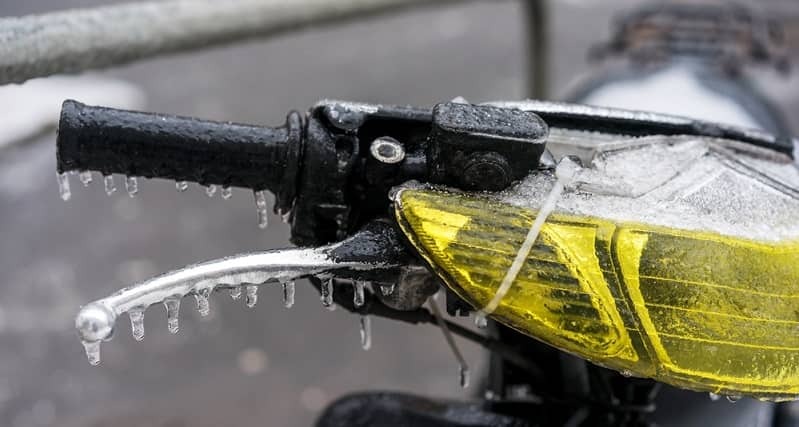 A problem with a well-covered bike is the buildup of condensation. The Protex Stretch is ventilated to reduce this without any rainwater getting in. Soft lining prevents scratches to the bike and there’s lock pouches at the front and rear. At first glance the Moto GP cover looks light and only really suitable for the rain. However it retains many of the features of heavier duty models. These include heat-resistant layers, elasticated rim and fast buckle fixing strap and a fully waterproof outer cover strong enough to handle the snow and ice. It is roomy enough to cover wide handlebars and mirrors but may lack the outer accessories of more expensive models. Riders can enjoy at least five years from a good cover which equates to very little annually for keeping your machine in good condition. Consider a cover as an investment for preserving the paintwork and other parts. A bike left out in the scorching sun for several days will suffer fading and peeling bodywork. Relentless rain, snow, ice or blowing sand will also affect the paint. A motorcycle cover may not prevent the theft of your bike but it’s concealing and delaying characteristics cannot be denied.